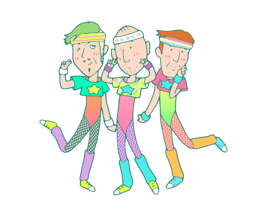 http://www.line-stickers.com/ – Animated Uki Uki Aerobics Line Sticker | Enjoy a fabulous time with the Animated Uki Uki Aerobics stickers, featuring the third appearance of Calbeeʹs Hitokuchi Gekijoʹs hit official character, old man Ami Tights Ojisan! Friend Calbee Hitokuchi Gekijoʹs official account to get the set! Available till February 9, 2015.